The new Traveler Quest 8 is the latest addition to our portable lightweight, “all-in-one” PA systems. The TQ8 runs on AC or battery power and comes standard with built-in batteries and charger. The TQ8 can be configured with up to two wireless receivers, with handheld mic or body pack transmitter configurations. The body pack is available with headset mic or lav options. Features of the TQ8 include a built-in 150 watt amplifier with an 8" woofer, 1" horn, two XLR / 1/4" combo inputs each with their own volume control, one RCA input and one AUX 1/8" input with shared volume control, 3-band EQ with master volume control, and built-in media player with Bluetooth®. The built-in media player enables playing audio from a USB thumb/stick drive or from a Bluetooth® enabled device. Features also include an integrated handle for easy transportation which comes equipped with a 1-3/8" (35 mm) speaker pole socket for mounting. The TQ8 will operate on AC power indefinitely, as well as battery power for about 24 hours depending on the usage. A full recharge of the batteries takes about 7-8 hours. The TQ8 may be operated while batteries are recharging. If a power failure occurs when operating on AC, audio will not be interrupted and the unit will continue to operate until batteries are exhausted. The TQ8 features a voice priority button, which automatically reduces the volume of the media player, Bluetooth® and line level input when it receives a transmission from a wireless or wired handheld microphone (either plugged into the unit or an installed wireless system). The voice priority can be turned on or off. 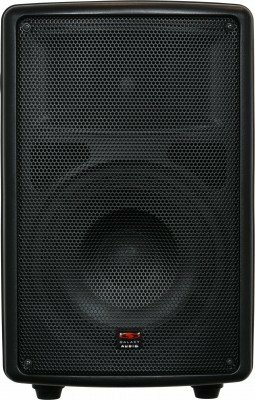 Whether being used for schools, House of Worship, emergency personnel, corporate functions, fairgrounds, auctioneers, graveside funeral services, or aerobics instruction, the TQ8 is an “all-in-one” portable PA that offers superior audio quality and reliable performance, all at an affordable price.